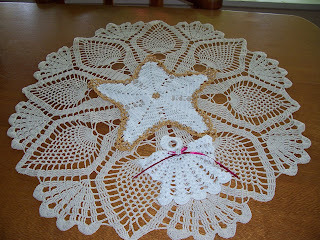 Grandma's Knitting Place: Look what I got for Christmas! Received my first Christmas Exchange for 2007 - from Linda in USA - thank you so much Linda!! 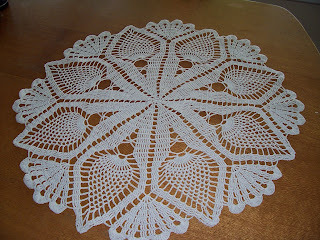 Two magnificient doilies and a gorgeous little Angel! I am starting to feel Christmassy already! oh my!! 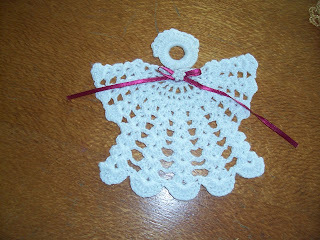 you are lucky to have received those gorgeous doilies & angel! and you have been very busy with both your needles and computer! thanks for the wonderful pics of your knitting AND of the countryside! i have NEVER seen a blossomed tree that bluish color before (only a blue Rose-of-Sharon shrub here in IOWA)... and the little shop where (i hope) you will sell many of your baby items! thanks for the welcome on knitbabysurprise! 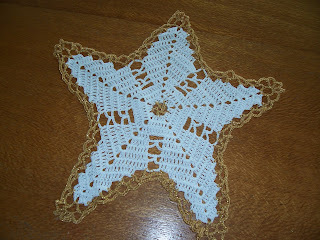 ps: i have some patterns & thread to try some doilies & snowflakes soon also!! KUDOS to your gift-maker! Dear Yvette, You have been soooo busy.... I really love all the baby items, and your xmas gifts are wonderful, and it isn't even December yet. I have never thought to adapt a knitted wool pattern to cotton. Ummm, another to do project.